Gesundes Kinzigtal was founded on September 21st, 2005 by Helmut Hildebrandt, CEO of Hamburg based OptiMedis AG, and Werner Witzenrath PhD, the then representative of MQNK, a network of physicians, and therapists. It was later registered in the Commercial Register at Freiburg. The aim of Gesundes Kinzigtal was to install, and operate an integrated care system for a defined region. This appointed region lies in the Black Forest and belongs to the Ortenaukreis in Baden-Württemberg in southwest Germany. The main towns in the Kinzig valley are - in alphabetical order - Gengenbach, Haslach, Hausach, Hornberg, and Wolfach. In the course of the same year the health insurance company AOK agreed on a long time cooperation, and made way for the funding of the newly founded enterprise. 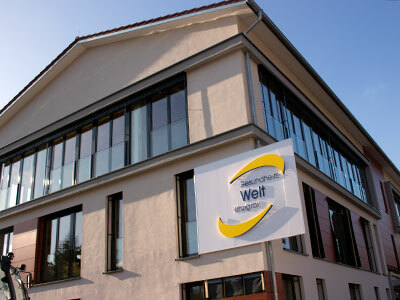 First investments included a small office in Haslach, hiring health care experts for developing new ideas and projects. As one of the key issues is a stable and working communication within the whole network, computers and networking standards had to be installed as well. A further step was to implement new forms and standards of dealing with patients, diagnoses, and communication within all network members including the company as well as all the physicians and therapists. The above photo shows Dr. Christopher Hermann from AOK (left to right) together with Helmut Hildebrandt, Dr. Werner Witzenrath, and Dr. Detlev Gessner just after signing the contract in Stuttgart. Not much later the LKK Baden-Würtemberg - now known as SVLFG - joined in. This health insurance company is only open to farmers, farm workers, and their families. 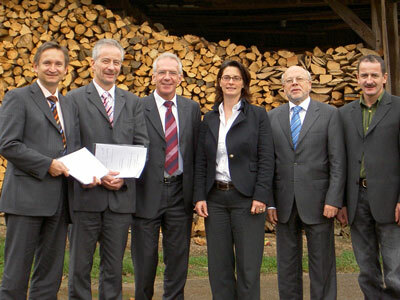 Celebrating at Ramsteiner Hof in Fischerbach: Helmut Hildebrandt (left to right), Reinhold Knittel and Harald Riedel from LKK, Bettina von Falck (Gesundes Kinzigtal), Dr. Werner Witzenrath, and host Ulrich Müller. The first care programs took off in 2006. A smoke prevention scheme (Rauchfreies Kinzigtal), a program for patients with osteoporosis (Starke Muskeln - feste Knochen), and one for elderly people (AGIL) were among the first installed. All of these and further programs were and are due to an accompanying research executed by an external group of scientists at Freiburg University. Their task is to coordinate the evaluation of the work done, and outcomes of the project. In November 2015 Gesundes Kinzigtal moved to Hausach. The Gesundheitswelt Kinzigtal (Health World Kinzigtal) offers more space, and gives Gesundes Kinzigtal a chance to implement new services such as activities, workshops and new health programs for the public. Corporate health management, trainings, and scientific research in all matters of health services are installed as well. The place to be: The Gesundheitswelt Kinzigtal in Hausach where Gesundes Kinzigtal is located since November 2015.